Cellar Door . . . Linguists call it the most beautiful phrase in the English language based solely on the way it sounds. But as you can imagine, what it represents may be something far more sinister. In a spectacular display of poetry, artwork, fiction, and photography, the talent of fifty contributors is showcased within these pages. Voices from behind cellar doors all over the world come together in unison to whisper in your ear . . . can you hear them? Are they knocking on your cellar door? Edited by Shawna L. Bernard, each piece in this anthology has a beautiful title intrinsically connected to the tale that follows, and a door will be the common theme which connects the widely varied styles, genres, and stories told. Will you take your chances and find what's lurking behind your cellar door? It is rare for the ears of many to hear a single sound all at once. Most often, we hearken to a tune for which we alone may be listening. You will find, however, that this anthology is a collective murmur. Voices from all over the world have come together to sing in unison through artwork, poetry, and fiction in a vast array of creative displays. Once you lift the cover of this book, you are opening the cellar door wide enough to cast a sliver of light upon the imaginations of visionary minds from every corner of a once-darkened, quiet room. Listen for the beauty of the language. In it, you will find the loneliness and longing of characters; the haunting sounds of anguish echoing against walls; love, loss, and things to be afraid of all in one place; a doorway to a universe you never knew existed. Using the common thread of what linguists call the most beautiful sounding phrase in the English language, we bring you a tapestry of work woven to ensure you all discover something that will move you. Sweep away the cobwebs and blow off the dust with each new tale within these pages . . .
. . . and find what’s behind your cellar door. "Cellar Door is an anthology of poetry, flash fiction, short stories, and visual art that all revolves around one common theme; the cellar door. Not just any cellar door, but the cellar door that we all knew as kids growing up. The one that always made you feel a little uncomfortable but that held such terrifying intrigue. The one where you made sure to watch over your shoulder as you turned your back to it. It’s the archetype of the cellar door that is seemingly so engrained in our minds and imaginations that has come to inspire each and every piece in this collection. Edited by Shawna L. Bernard, this anthology is one of huge volume and contains dozens and dozens of pieces to get lost in, and at first glance upon the subject matter it may seem as though the theme may become a little redundant, but rest assured, this is certainly not the case. Poems and short fiction that are included vary so much in voice, style, aesthetic, and even the use of the theme of the cellar door are so well implemented, that time and time again you are pleasantly surprised at the creativity and pure originality of each piece and each author. Influences ranging from Edgar Allan Poe to Stephen King are all present and it is really neat to compare and contrast each piece. Flipping to any random entry will surely draw you in and soon enough, you yourself will be conjuring up your own ideas and stories about cellar doors. Each story will harken you back to a time where that aging frame and rustic door handle sent chills down spine. 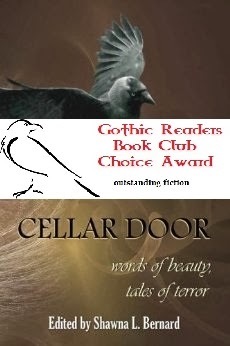 The diversity that can be found in Cellar Door is great and it is so easy to just get lost in a quick story or two when you may not have enough time to fully lose yourself in a novel." "The beautiful cover art draws us in. Once inside we find an anthology based on a simple concept that can inspire both wonder and fear. What I love about this collection is the diversity of imagination. As a reader it took me back to discovering the limitless possibilities of dark fantasy when I stumbled upon the early tales of Ray Bradbury. There's truly something in these pages for everyone. My personal favorite is Rose Blackthorn's Pressed Flower Memories. Exquisitely creepy with fascinating secrets. But there are other gems as well among the poetry, art, flash fiction and short story offerings. Editor Shawna L. Bernard has done a superb job creating a sense of unity that compliments the freedom to create. The deeper I ventured the more I could imagine each author whispering their story to me." "The first thing that captures me is the cover, an entrancing display of beauty and intrigue. The crow is the symbol for death in many beliefs, and as it sores effortlessly through a swirling chasm of light, you can't help but wonder what exactly awaits me on the other side. Shawna L. Bernard is masterful in her invite for the reader to explore the collection of stories that blend together into a harmonious vision as deceiving as the title they are bound to: Cellar Door. This anthology captures the imaginations we have tried to forget, those dark whispers that we dare not answer, providing a tantalizing array for every favored form of expression. From poetry to flash and short stories, Cellar Door delivers the perfect burst of wonder for everyone, whether you are seeking a short escape from the mundane or thirst for a mixture of nightmares that keeps going, consistently changing and keeping you in awe, this is the collection for you. I found what was lurking behind my cellar door. I invite you to discover what's behind yours..."
"There are some places in my mind where I seldom go. They are rooms of imagination, impression and memory that are often better left undisturbed because they are full of old fears and terrors which still have the power to grip me. They are better off left to moulder behind locked doors. This anthology tells me that I’m not alone in this respect. The premise is a potent one — take a theme <a cellar door> and write about what might be lurking behind it. It is an idea which strikes a chord with many people. A lot of houses have basements and it is not hard to imagine yourself standing on the uppermost step of the stairway leading down looking into the darkness below in that instant before the light comes on. What’s lurking down there? Poets, flash-fiction authors, the writers of longer stories and artists from around the world have all drawn on their undeniable talents to imagine. A hell-bound mechanical train; a toolbox of peculiar photographs; a mother and father, kept in chains, a boy who wants to introduce you to his “sisters” in a dead house; something indefinable but surely menacing? And there is no limit to the breadth of the terror even in the way in which these stories are told — I am still taken by Aaron Gudmunson’s tale of terror conducted over a Twitterspeak mobile phone and still find myself inwardly reciting Aaron Besson’s catchy bit of doggerel about People under the Stairs in his surreal story <maybe its Scots-Irish vernacular appeals to me> or in imagining the deranged child drumming alone in his cellar whilst his parents die upstairs, in Tom Johnstone’s “Little Drummer Boy”. And, as a sometime historian, I find myself taken on a nightmare journey through 13th century Edinburgh…or a strange man with a peculiar taste for feet in revolutionary France in a story by J.T. Seate. There are too many stories and poems within this anthology to review comprehensively—and I’m not going to try—but each one reflects the horror of some dark world, lying around the foot of the descending cellar steps or up in that shuttered attic. 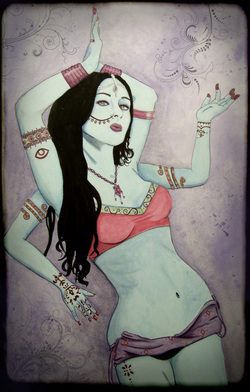 And they are brilliantly illustrated in paintings and drawings which are evocative of each tale. This is definitely a book for the winter, when the nights are dark and the wind makes strange houses through the house. It is a book to be savoured and shuddered at. It will take you to places in your mind where you really shouldn’t go." “Linguists call it the most beautiful phrase in the English Language,” is the insightful description of “Cellar Door.” After reading those words, I literally uttered the phrase out loud. It is quite lovely indeed, gliding off the tongue as soft butter. The description continues: “What it represents may be something far more sinister.” There’s the catch! The horrifyingly beautiful catch! “Cellar Door” follows through with the promise its description dictates. Ms. Bernard leads us poetically through the first cellar door to open with an introduction that draws you gently into a realm of varying facets of horror. 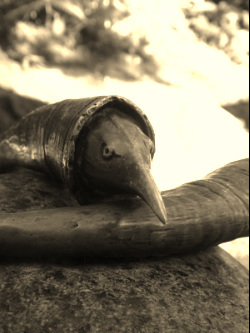 Poetry leads the Cellar Door’s entry with Stephanie M. Wytovich and her verse, “Hide and Seek.” Without rhyme, Wytovich paints a gracefully flowing eerie picture. In contrast, “Last Lament” by Matthew Wilson uses rhyme and meter to draw a shiver not simply down the spine, but in the recesses of the reader’s mind. Part II in this tome of terror takes us into horror in a flash…flash fiction that is! These stories may be short but they are not short on scares. Ken MacGregor uses his talent as proof that horror can be found in but a few words with his contribution called “Door in the Floor.” Have you ever had a buddy who would do just about anything on a dare or otherwise? Well dear readers, this one adds a spin on that you won’t soon forget! Another short, but not short on scare the heebie-jeebies out of you, is “Cellular Door” by Aaron Gudmunson. With a series of texts, this one weaves its reader straight into heart pounding horror without missing a beat. You may want to cancel your text messaging feature after reading this one. I kid you not! “Cellar Door” continues with Part III. The stories are a bit longer here, holding you relentlessly by the throat. These stories, dear lovers of the macabre, are not simply short but masterfully crafted pieces. One short that stood out above the rest-which was not an easy choice by any means-is a story by Erik Gustafson called “Sweet Songs of the Earth.” In one word: mesmerizing. The assemblage of words was so well structured, it literally seemed to sing on the page. Although creepy, nevertheless they moved me, held me, captivated me until the final word as I shuddered helplessly. This reviewer does not scare easily, but Gustafson truly knows where to tweak your nerves just right. Seeing the image of a cellar door the same is no longer an option. This book has changed its simulacrum in more than one wicked way. Part IV takes on horror visually. Artwork and photography are covered in this chapter. Sketches and photos are interspersed between the many authors in this anthology. Images both beautiful and disturbing. The editor, Shawna L. Bernard is not only a talented editor but a photographer as well! Bernard contributes six intriguingly eerie pieces. One is so exceptional, this reviewer had to take another glance; not knowing if it was a photo or a drawing! This amazing piece of portraiture, entitled “Demesne,” is truly a feast for the eyes! Who would have known that the author/poetess Rose Blackthorn, also has an eye for photographic art! “Doorway,” by Rose Blackthorn is appropriately titled. The photograph draws you in through a forest scene that resembles an otherworldly portal. This photo is definitely an inspirational illustration of beauty and mystery. May I have an autographed copy of this one, Ms. Blackthorn? “Cellar Door” is a beautiful Anthology. It may seem unusual to describe an Anthology of Horror as beautiful, but believe this reviewer, once read, you will agree. Just as the book is described, “Linguists call it the most beautiful phrase in the English language”—Ms. Bernard you have succeeded. “Cellar Door” is Beautiful! "This showed so much creativity! Poetry, visual arts, and of course, the stories. The content made me think of the wonderful old stories from bygone times, very subtle. Effective horror can hide in plain sight, only being recognized by those who--in certain slant of light--glimpse it. After being turned off from modern horror time and again, I wondered if I was stuck re reading the classics. But with persistence, you can find books such as this, which not only entertain, but also show the art is not lost. Encouraging to know there are people who still get it, and a fun read. A keeper." Dark, dank holes in the ground. Cellars. Sinister corners. Stale, damp air. In the anthology, Cellar Door: Words of Beauty, Tales of Terror, editor Shawna L. Bernard has compiled a collection of works in which authors draw a sharp contrast between the allure of the unknown down those steps and the terror of discovery when one reaches the bottom. I applaud Bernard’s bold move on opening the collection with a poetry section. The selections are haunting and evocative. Theresa Newbill’s “Olive Branch” closes with the lines “an olive branch bearing fruit, not to be trusted"; and thus highlights the disturbing juxtaposition of imagery through the anthology. Rose Blackthorn gives us “the dark has no end” in her selection “Beneath Yellow Roses.” The poets gently lure us into the seductive hush of the cellar. and oppressive sense of foreboding.” The perfect imagery for those unseen terrors lurking just beyond our line of sight. The final section, the short stories, tears the façade away to reveal the horrors within. Gregory Norris, in his story “Stray Cat,” tells us without hesitation that it is “out there.” We know it and there is nothing we can do. Tracy L. Carbone, in “Visions of a New York Loft,” asks, “But I’m safe now?” Quite simply, no you are not safe now. 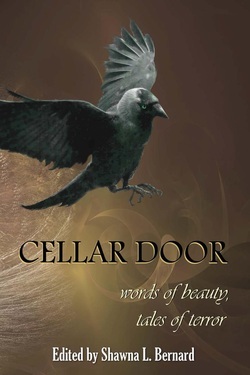 Bernard has put together a great collection here..."
"Edited by Shawna L. Bernard, Cellar Door: Words of Beauty, Tales of Terror is a unique collection. The stories are linked by title to create a loose thread between the tales. A simulation of opening doors, passing through, never to return to your point of origin. The poetry, flash fiction, and short stories take the reader down shadowy corridors and through haunted cold spots to reveal monstrous horrors hidden in the darkness. The works here are eclectic and terrifying. If You Like: Algernon Blackwood, H.P. Lovecraft, Sheridan Le Fanu, Guy de Maupassant"
*The original edition of this book is no longer available. More details forthcoming.